Te Wharehou O Tuhoe is the new iwi and civil defence headquarters for Tuhoe (Te Uru Taumatua) located in Taneatua in the Bay of Plenty on the east coast of the North Island, New Zealand. Designed by Jasmax, built by Arrow International, with the structural design provided and completed by mlb Consulting Engineers who are specialist Chartered Professional Engineers in the design of timber structures. 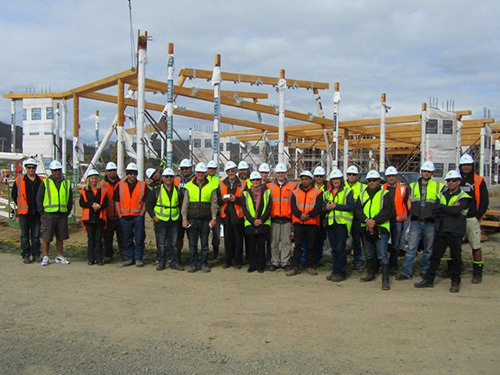 This is the first project built in New Zealand in accordance with the North American Living Building Challenge. This is the most stringent sustainability criterion that can be applied to buildings. The buildings include the meeting hall, link, administration, and the photovoltaic structure. The timber structural systems were designed to minimize embodied energy and carbon emissions. The design was to have minimal structural damage under a large earthquake and provide emergency shelter to the surrounding community. Uglie MultiPoles are naturally tapered, de-barked poles that provide greater skin friction via installing driven pole foundations. Two hundred and sixteen pieces ranging from 200-300SED and up to12.0m long were vibrated through the silt, sandy liquefiable top layer and then 2.0 meters into the gravel layer. Reinforcing rods were then grouted into the MultiPole cores. The UniLog MultiPole Structural Columns range from 180 – 350mm in diameter and up to 8.0m long. The UniLog MultiPole Diaphragm Floor Panels use 240mm dia. components, and in panels up to 4.4m long x 3.0m wide. The UniLog MultiPole Post-Tensioned Shear Wall Panels use 180 – 225mm dia. components and in panels up to 6.5m high x 6.0m wide. The UniLog MultiPole floor and wall panels are constructed with components using our unique shear key scallop system. The MultiPole entrance struts were turned from single poles. UniLog Multipoles are uniform diameter, machined poles. The buildings timber structural design and components were CAD modelled by TTT and shop drawings produced. Each column, floor or wall panel was unique, with all the rebates, scarfs, cuts, shaved edges and pre-drilled holes completed at TTT. Shop drawings were also produced for the column base, post-tensioned wall anchorage and the entrance arch strut brackets. UniLog components were also manufactured as part of the composite floor system used as part of the ground floor administration building. All the interior components were dried down to a specified moisture content and treated to Boron H1.2, the above ground components to MCA (Micronised Copper Azole) H3.2, and in-ground foundation piles to MCA H5. All interior components were coated with a temporary protective coating and wrapped to maintain the moisture content. TTT installed the MultiPole driven foundation poles, structural columns, diaphragm floor panels, post-tensioned shear wall panels, entrance struts, and the separate photovoltaic structure.This project involved many firsts for TTT Products and could not have been achieved without the dedication, commitment and skill of the entire TTT Products Team.